Walter White’s alter ego in the TV show Breaking Bad. But, you know that. Was an unassuming science teacher, but got some cancer and decided to sell meth. I think I missed a few things in there, but he also started to use the psuedonym Heisenberg, as in a tribute to Uncertainty principle science genious Werner Heisenberg. Can anybody tell I have no idea what I’m talking about? I do know that this show is the hottest thing on television and that one of my favorite comedians, Bill Burr, is in it now. 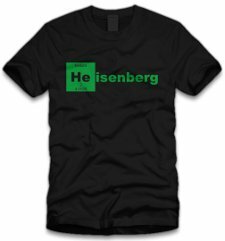 So, that’s why you should purchase and wear often this Helium Breaking Bad Heisenberg T Shirt. It’s a shout out to science and sophisticated pop culture. That’s an oxymoron but you know what I mean. Five Finger Tees Review in case you’re not sure if you should do business with them.